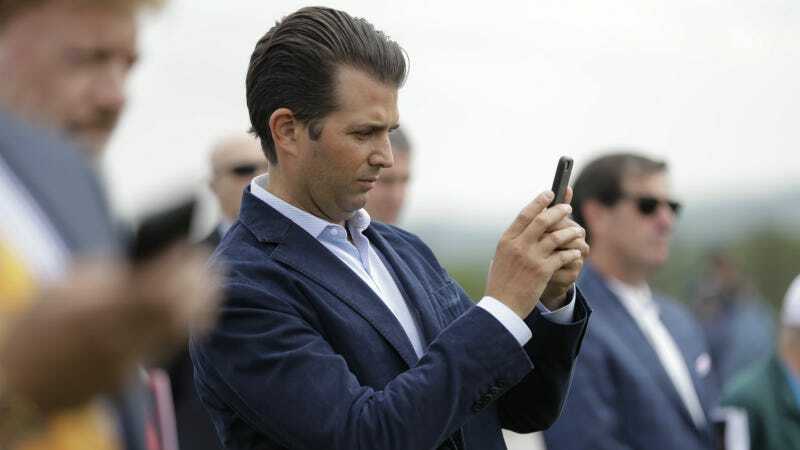 Donald J. Trump Jr., lustrous hair farm and the acting brains of the Trump Organization, has released some emails on Twitter relating to his meeting with a Russian lawyer who promised him damaging information on Hillary Clinton. The emails show he was promised “sensitive” information that was “part of Russia and its government’s support for Mr. Trump.” You might think the only possible explanations for posting these emails are either a sudden brain injury or a firm conviction that nothing matters. In fact, the real explanation is much dumber. To review: news of the meeting was first broken by the New York Times on Saturday. Trump Jr., as his opening gambit, first claimed that the meeting with attorney Natalia Veselnitskaya was “a program about the adoption of Russian children.” He then admitted, because the Times made him, that the real intent of the meeting was to gather damaging opposition research on Clinton. Veselnitskaya does not directly work for the Kremlin but has a history of advocating for Russian government clients and state-owned businesses. At that point, it would have been wise to stop tweeting, but the Trump family is uniquely afflicted with a condition where their id is hooked up directly to a keyboard. And so this morning, Trump Jr. tweeted out screenshots of the emails he exchanged with Rob Goldstone, the publicist who arranged the meeting. Elsewhere in the emails, Veselnitskaya is identified by Goldstone as a “Russian government lawyer.” And Don Jr. helpfully volunteers that he’s bringing along Paul Manafort, the campaign chair at the time, and Jared Kushner, Trump’s son-in-law and now a chief White House advisor, thus demolishing any claim that this wasn’t a meeting meant to aid the campaign. To be clear, “getting ahead of the story” doesn’t work when the story is about you colluding with a foreign government in the most bumbling and oafish way possible. Donald Trump himself hasn’t commented on this story yet, but we all know that means there’s a raft of regrettable tweets coming early tomorrow. Truly: God bless this family and their inability to log off.